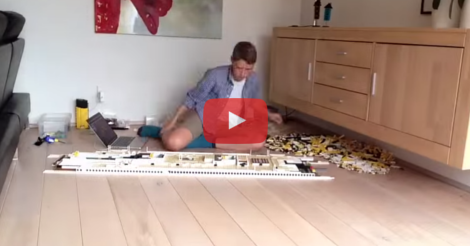 He Sat Down With 30,000 Legos And Built THIS! It Looks So REAL! It’s good for kids to have hobbies! I strongly believe in a child having interests other than television in order to use their brains to practice problem-solving and branching out into more creative outlets. This kid definitely found something amazing to occupy his time with, and he was very dedicated! He spent hours each day pouring over the plans for the ship, building it piece by piece using a diagram. I’m not sure if he made the plans on his own or if he found them online, but I applaud his drive. Did anyone think he grew a bit before this massive project was completed? Maybe that was just me, but the finished piece is amazing! I wouldn’t be surprised if he ends up working for LEGO after this! His video can be a huge part of his application, that’s for sure. The music choice was a little odd, but overall this was an impressive feat! The finished project is HUGE! I wish he had taken a picture before he started the project sitting next to all of the pieces because this is really cool! Even the inside was mostly completed to mimic the real thing! Now the biggest question of all…where do you think he kept it after it was completed?! She Cuts Up An Old Sweater And Makes A Beanie AND Leg Warmers! A Perfect Way To Re-Use Old Sweaters!